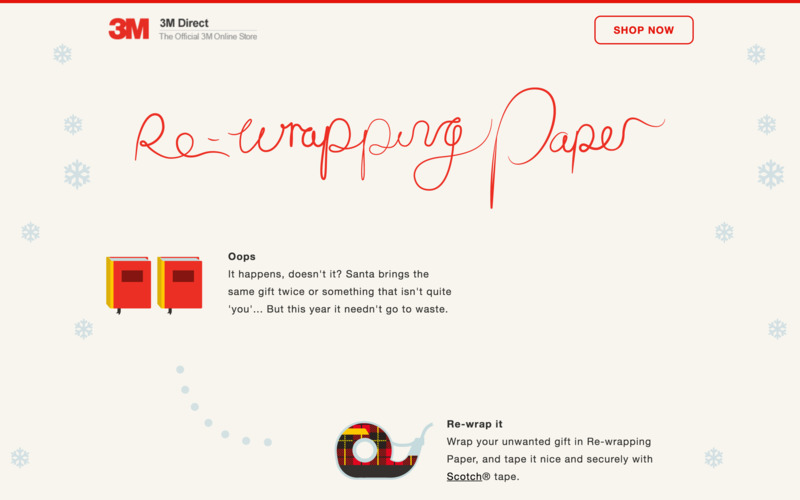 In response to 3M’s brief to promoted their e-commerce site and increased sales of their sub brands over Christmas, the creative team at The Corner created a campaign which encouraged people to re-wrap and donate their unwanted presents. I led a small team, overseeing the design and front-end development of a one page site, that explained the idea and introduced the charities, in a fun and engaging way. As the clients site was not yet built for the modern web, I worked closely with the Front-end Developer making sure that the design translated well and took full advantage of modern front-end techniques and technology. The end result was a delightful, informative and festive page with parallax-effect snow flakes and scroll-activated animations.